Life is about 10% of what happens to you and 90% of what you make it. Folk often invert this quote by believing life is 90% of what happens to you and only 10% of what you make it. Using this inverted perspective makes us a victim. We go through life feeling powerless and helpless. We become subjected to whatever comes our way. Success is not just for those who are born with a silver spoon in their mouth. Success is also for those who take situations they are in and either work or change the situation to an advantage. It is about taking the bitter and making it sweet. You’ve heard the saying that says something like, “when life deals you lemons, make lemonade”. We, as a people are not rendered helpless in the condition we are in. We only “think” we are. If we “want change” in our lives, in our relationships, communities, cultural systems and economics— we can do it, ourselves— together— but only together. Let’s take this example. I have a dozen more options for you to choose from. But let’s use this one. You are struggling with 2 children and paying babysitters to go to work. You are paying bills, have grocery shopping to do, and exhausted by end of day. Your life is habitual, and there is no balance for any time for your self and you do not have a social life. Let’s say you have two cousins who are living a similar life. You three are at a family reunion, and during the course of a conversation with your cousins, you find you are having the same challenges. Your lives are similar in the ways of: each of you is paying $1000 in monthly rent; you each have a car and are paying approximately $200 monthly in car notes; and electricity is on average $150 a month, per person. You have an uncle selling a 4 story apartment building. You would like to buy it. Cannot afford it? Yes, you can! Let’s say you and your two cousins each make $30K a year. That is not much money separately, but together, it is $90K a year! The building is selling for $300K. Down deposit is $30K. Coming up with 30K individually is a lot of money. But the three of you can come up with $30K collectively— at $10K each. Get you a good realtor and he/she will connect you with the resources to get you credit ready. It is time to establish a cousin sisterhood. It is time to live as sisters. It is time to consider the options of coming together and moving away from barely making it, with minimal life enjoyment, to becoming financially successful practically over night. We need to design our own success— together. There are ways in which to do this. As sister cousins, you can own that building, rent out one floor of the building to a good tenant, and each of you can have your own floor, sharing 2/3 of the mortgage and having your tenant pay the rest. Let’s say your mortgage is $3K per month. Your tenant pays $1K, and you three sister cousins, split the 2K three ways. What is that per month—$667? Currently, you are paying more for rent— and you don’t even own it. You are saving $333 a month, and you are a property owner. Consider the perks with this arrangement! You have two potential baby sitters (free). Have the option of splitting car notes. You have a small community in your own building. You have a family who is a powerful resource. Maybe you do not need 3 cars— maybe only two between you? You can split the grocery bill by buying in bulk. You can open 1 bank account for the building and maintenance costs. Each of you can put 1/3 of your rent savings into the maintenance account. The three of you trust each other with your children, so perhaps you can go out and socialize every now and again. Get where I am heading? As Americans we have been socialized to be an individualistic society, yet the biggest of companies and banks are merging and becoming financial giants together despite their differences, because money is the object. Guess what? The little banks and individual companies are battling against these giants and they are having a hard time winning. In observing how the companies are operating, we must note that trying to be financially successful alone is not financially feasible. Doing the individual thing is not profitable. If it is not profitable, it is not sensible. Companies, who have much more money than us, have learned to stay in the game; in knowing that being solo is now a no go. There is just no money to be made in that philosophy. We must follow their lead. They are doing what we should be doing. Merging together! We are funding their operations. Who is funding ours? How many of them are sponsors to our businesses? How many of us are being sponsored? Not even a fraction of us. Yet we are funding and sponsoring them! Yep! We are funding stockholders of these businesses and corporations, and their children’s college funds. Our money! The corporations are rich off of our dollars, and they are doing this together. We need unity. We need to merge as a people. We need togetherness to meet the economic need. We need to really make our dollars work for us. But we need a change in how we think. We need to change how we feel. We need a new focus. We must go back to the basics! Together we built pyramids. We established our families collectively. We created the family system. The concept of, “it takes a village” is ours. The cause for change is in our hands! We can change our financial situation at any time. Together! How many homeless people are living the individualistic American Dream! How is that working? If each homeless person went home what do you think will happen? They are no longer homeless. Unless one’s entire family has been wiped out, we all have someone to go home to. If we have burned bridges, it is time out for pride. Go home, and apologize. Go back to Love. Love is waiting for you at home. Get it together, to be together! In order to build together we cannot be selfish and think selfishly. We cannot be petty and narrow minded. Not only do we need to build “togetherness”, but we must think togetherness. You make $30K? I make $50K. Together we are $80K. What perks and resources do you to bring to the table? Here are mine! Together and only together can we be financially successful. 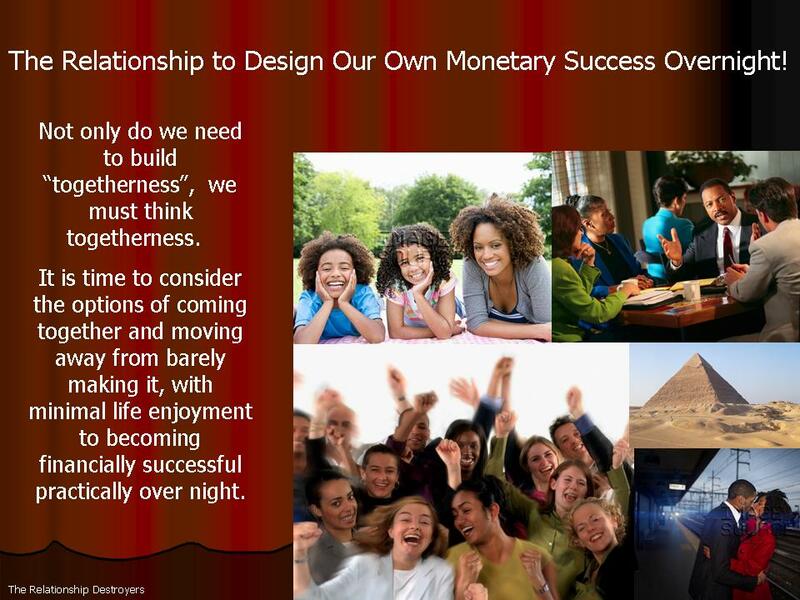 This entry was posted in Live and tagged be financially sound by thinking togetherness, change from individual to together, change your financial situation by being together, relationships that make money, together we can be financially successful. Bookmark the permalink. Excellent article!!! keep up the good work….